Looking for exotic cat breeds that make excellent pets? Check out these 10 gorgeous breeds that definitely stand out in a crowd! 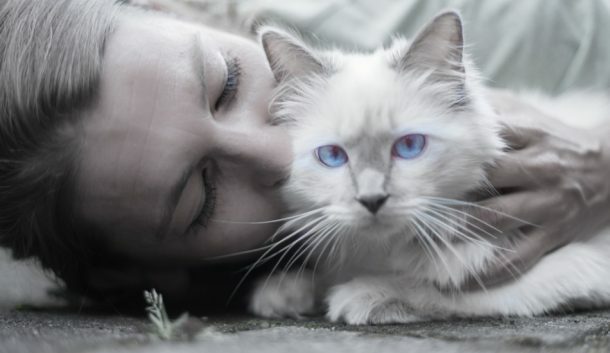 So, you want a cat, but a common breed like Tabby or Ragdoll just isn’t for you, right? You want something a bit on the wild side, right? A unique cat for your unique personality? Well, that’s where exotic cat breeds come into play. Now, we’re not talking about lions and tigers and pumas (oh my!). They may be exotic, but they do not belong in houses! Still, there are some more exotic cat breeds that you actually CAN adopt that make great family pets! Let’s check them out, along with some cute or informational videos about each one! Bengal cats feature an exotic appearance without the wild cat danger. These cats came about by breeding domestic cats with Asian Leopard cats. They are not recommended for first-time cat owners because of the fact they are active, curious and require a great deal of attention. Bengals are also affectionate, intelligent and social. RELATED: Wondering what a Bengal Munchkin Cat Looks like? Read our guide. 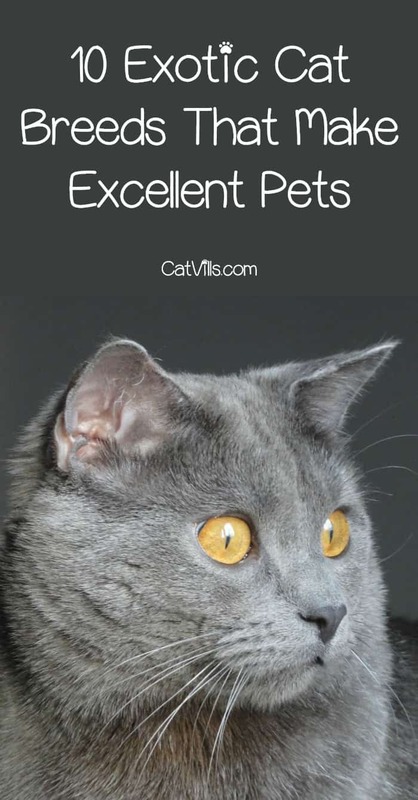 The Chartreux cat originates from France and features a gorgeous blue, plush coat. They first made their way to the U.S. in 1970 and were recognized by the Cat Fanciers Association in 1987. The Chartreux is the perfect lap cat and TV watching companion. Many folks have compared the Devon Rex with folklore pixies, both in appearance and personality. Physically, these cats have big eyes, long legs and a slender body. Personality wise, the Devon Rex are active, mischievous and smart. The Exotic Shorthair cat breed is a lot like the Persian cat breed, in the fact that they both have the same beautiful, sweet face, but the Exotic Shorthair has a shorter coat and is more active than the Persian. These cats are easygoing, loyal and peaceful. The Ocicat looks like a wild cat because of its spots, but is 100% domestic. The spots, randomly situated throughout the body, feature various colors including blue, chocolate, cinnamon, fawn, lavender or tawny. These cats came about as the result of the pairing of a male Abyssinian cat and a female Siamese cat. The Pixie Bob cat breed looks wild and exotic, but they are really a mild-behavioral breed of cat. What makes these cats stand out above the other cat breeds is that they feature a trait known as polydactylism, meaning they have more than the normal number of toes. The Scottish Fold looks somewhat like an owl because of its unique feature, ears that fold forward. The Scottish Fold was created from breeding an array of cat breeds including American Shorthairs, Burmese, Exotics and Persians. These cats are curious, dexterous and outgoing. How cute is this video of this Scottish Fold riding in the car for the first time? The Singapura cat breed hails from Singapore and developed as a breed in the U.S. during the 1970’s. These cats are the smallest cat breed, weighing an average of 5-7 pounds. The Singapura cat breed are known to be curious, intelligent and playful. The Sokoke cat breed originated from Kenya in Africa. These cats somewhat resemble cheetahs with their wild cat appearance, but they are indeed domestic. They are known for their unique features, including blotched tabby coat pattern, almond-shaped eyes and stiff tail. The Sphynx is a hairless cat breed that hails from Toronto, Canada. While it is true they are hairless, they are not considered hypoallergenic because they do produce dead skin cells, also called dander. These cats make great family pets and are often used as show cats. This video cracks me up! All of these exotic cat breeds make great family pets. Even better, they’re actually MEANT to be family pets. Remember, even though lions and tigers and pumas look beautiful in the wild, they are supposed to STAY in the wild. They don’t belong in houses. In fact, owning one as a pet may not just be dangerous, in many places it’s illegal! Do you have any of these gorgeous exotic cat breeds as a family pet? Share your experiences below! I like Bengal cats. I’ve seen some in the movies and on youtube videos. They look like a small leopards and their skin/hair is not very thick. I’d love to have one. Well, if you like that, you may want to check out the savannah cat!!! WOW!!! The bengal is my favorite cat ever. I’ve never been a cat person but recent years I’ve really wanted to get a bengal. The others are super cute too. These cats are beautiful! I had a tabby and a calico and though those are pretty ordinary breeds I loved them like crazy! Scottish Fold is gorgeous! Though Bengal as famous is really beautiful. Do you know what Garfield breed is? Because I love that lazy cat. I would like a Pixie-bob cat if I were to choose one from the list. I don’t like the look of the sphynx. We are a cat family. Oh my gosh, I’m totally a cat person and love this! But at the same time, missed my two Persian cats who passed away. I think I want an exotic shorthair this time. I’m not a cat person at all but I do have some friends who would find this so helpful!